On a hot August day, a convoy of school buses dropped off more than 200 kids between the ages of 3 and 7 at the Robert A. DuFour Athletic Center at Catholic University of America. When they stepped off the buses the children were greeted with high-fives a chorus of cheers from George Washington University School of Medicine and Health Sciences (SMHS) students. As part of Community Service Day, a longstanding tradition, first-year medical (MD), physician assistant (PA), and physical therapy (PT) students volunteered for the Young Athletes Fall Festival organized in collaboration with Special Olympics. The Special Olympics Young Athletes program is a unique sport and play project for young children with intellectual disabilities. The focus is on fun activities that are important to mental and physical growth. Children participate in games that develop motor skills and hand-eye coordination. 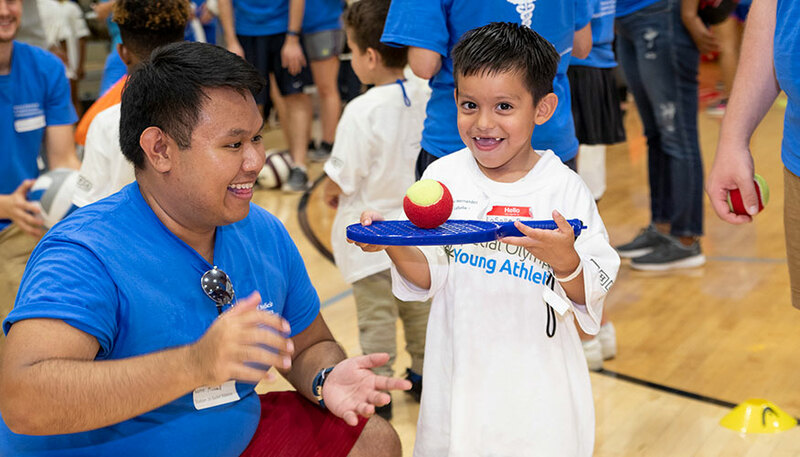 Student volunteers helped the kids navigate obstacle courses stationed around the athletic center and tested their fine motor skills with other challenges, such as balancing a ball on a small racket. The event also offered students the opportunity to mingle with their colleagues in different programs and step outside of the classroom to interact with their community.